"The quickest way to unlock your talent is to take the flute out of the box." 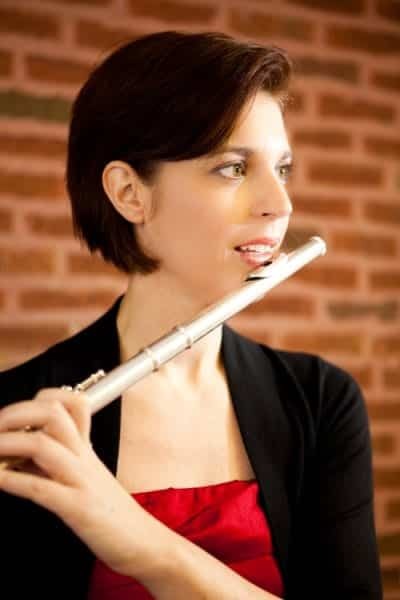 Our flute instructor, Kristin Paxinos, believes the most important goal in flute lessons is fostering an enjoyment for music that lasts a lifetime. Beginning students will learn proper posture, breathing, and hand position through simple melodies and scales. Intermediate and advanced students will use a variety of repertoire and technical exercises to develop more advanced aspects of flute playing, including tone, technique, interpretation, and performance. Flute students at Da Capo develop a strong foundation in technique, theory, and reading skills, enabling them to eventually learn to teach themselves. Kristin Paxinos received a Bachelor of Music from Indiana University, and a Master of Music from DePaul University. Before founding Da Capo, Kristin performed at Carnegie Hall, Lincoln Center, and Chicago Symphony Center with top tier orchestras such as the Chicago Symphony Orchestra. Kristin has over 26 years of teaching experience, working with flute players of all ages from beginners first learning to hold the instrument, to advanced students preparing for ILMEA and college auditions. Kristin is an expert in flute technique and tone production. Her lessons focus on helping flute students develop a strong tone; building a solid foundation in technique, posture, and proper breath control; and studying solo and ensemble repertoire for recitals and competitions. Kristin emphasizes technique and theory, and engages her students through the pure mechanics of sound production. She equips them with the tools and skill sets required to build musical mastery on their own. Looking to purchase a new instrument or need a good flute repair specialist? Check our out Flute Resources page for our list of recommendations.